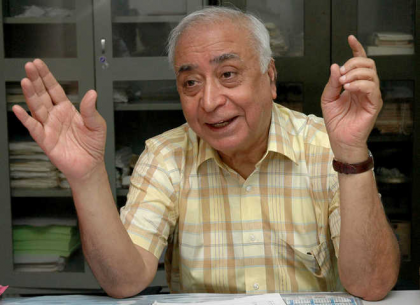 Chandigarh: Prof N N Wig, the doyen of Psychiatry in India who led many pioneering studies related to mental health at national and international levels and headed departments in various prestigious institutions like AIIMS, Delhi and PGIMER, died here at the age of 88 after a brief illness. He breathed his last on friday at the Post-Graduate Institute of Medical Education and Research (PGIMER), where he had set up the psychiatry department in 1963. He was also head of the Department of Psychiatry at the All India Institute of Medical Sciences, Delhi. He contributed to the development of mental health programmes in India and many other other countries. Members of the fraternity paid tributes to Wig, recalling his seminal contributions to research in the field. Describing Wig as “a living legend of Indian Psychiatry”, Ajit Avasthi, Professor & Head, Department of Psychiatry, PGIMER, Chandigarh said his vision will continue to guide the students and staff of the institute. Wig was born on October 1, 1930 in Gujranwala, Pakistan. He completed his MBBS from KG Medical College, Lucknow in 1953 and MD Medicine from Lucknow University in 1957. He pursued his interest in psychiatry by training at the All India Institute of Mental Health (now NIMHANS), Bengaluru. On his return, he joined the Medical College at Lucknow as a lecturer in neuropsychiatry. It is here that he started the first general hospital psychiatry unit in India. For two years (1961-62) he was on a Rockefeller Foundation Fellowship and received training at the Maudsley Hospital, Institute of Psychiatry, London and the Western Psychiatric Institute, Pittsburgh, U.S.A. He completed the Diploma in Psychological Medicine both from England and Scotland during this period. Wig joined the PGIMER in 1963 and headed the Department till 1980. After this, he was the Head of the Department of Psychiatry at the All India Institute of Medical Sciences, New Delhi. From 1984 till 1990 he was the Regional Advisor for Mental Health at the Regional office of the Eastern Mediterranean (EMRO) of the World Health Organisation at Alexandria, Egypt. In this capacity, he contributed to the development of mental health programmes of 22 countries in the region, the PGIMER release said. Under his able leadership the Department of Psychiatry, PGIMER established itself as one of the leading training and research centres in the country. “The Department’s reputation was enhanced in 1976 when the WHO designated it as a ‘WHO Collaborating Centre for Mental Health’, the first such centre in Asia to be accorded this honour,” it said. A number of multi-centric WHO research projects followed, the most notable among them being the ‘Strategies for Extending Mental Health Services to Developing Countries’ and the ‘Determinants of Outcome of Severe Mental Disorder (DOSMed). “The community mental health programme started in Raipur Rani, District Ambala, Haryana, as a part of these projects eventually provided the model for the National Mental Health Programme in India and inspired similar programmes in other developing countries,” it said. The institute noted that Wig’s research has been pioneering in a number of ways. He was the first psychiatrist to focus on the understanding of course of mental disorders in India. He led a number of multidisciplinary studies in consultation-liaison psychiatry with the Departments of Obstetrics and Gynaecology, Nephrology, Paediatrics, Neurology, it said. Wig also contributed to the classification of psychiatric disorders in India and at the international level. Wig contributed immensely to the development of psychiatry in India. He was the Honorary General Secretary of the Indian Psychiatric Society from 1968-1973, the PGIMER said. It recalled his contributions to research in the area of nosology, culture-bound syndromes, course and outcome of psychoses, psychotherapy and psychology. Professor Wig had many honours to his name including naming of a unit after him at the Fountain House Psychiatric Centre at Lahore.